Giveaway #1: Box o’ Papersource Goodies! — Sweetchic Events, Inc. Giveaway #1: Box o’ Papersource Goodies! As promised in my post last week, I’m kicking off Sweetchic Birthday Month with Giveaway #1: Some of you may recall the paper bonanza I received from my friend a while back (yea, I know you wanted some too, hehe, now here’s your chance! :) ) And so I’m going to share the wealth with one lucky winner who will receive a box full o’ PaperSource supplies from my stash! The winner can designate a range of colors they would like, and I’ll do my best to accommodate with cover-weightand text-weight stocks, envelopes in varying sizes, etc. (or, I can surprise you!). Oh yes, some of this can be yours! 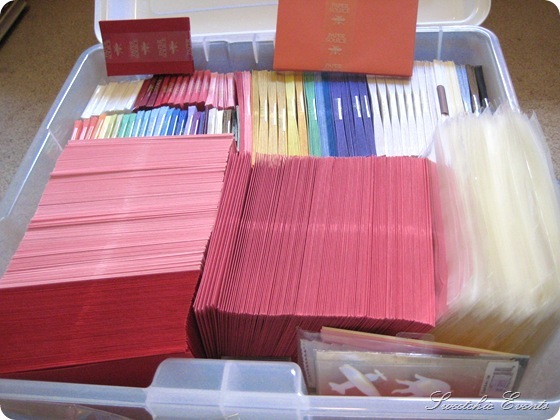 There are paper and envelopes in every color, size, shape and texture you can imagine! 1. Comment on this post! 2. Join the Sweetchic Events Fan Page and comment on my wall so that I know you joined! 3. Do both 1 & 2 for double the chance to win! Easy-peasy, right? I will randomly choose a winner on Friday before revealing next week’s new giveaway on Monday! Please help me spread the word!